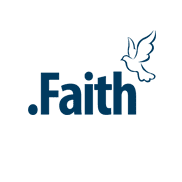 .FAITH is a new generic Top Level Domain name approved by ICANN. This web address was created for churches, seminaries, religious newsletters, religious organizations and groups of spiritual support, that share common belief. And it is a good way to increase their search rankings with a .FAITH domain. Plus Internet is a powerful media to deliver information and services to a wide audience, do that effective and o that quick. FAITH domains are open to everyone.